Only 7% of children in the world's 73 poorest countries are fully immunized. Finding one single missing child can be difficult. So imagine trying to find millions of children who are living completely under the radar with no formal record of their existence. This is the challenge that we in the global health community now face as we try to protect every child from vaccine-preventable infectious disease. With one in four children born without being registered, it is an identity crisis that now represents one of the biggest barriers to achieving our development goals; a problem so systemic that nothing short of a Copernican revolution within global health is likely to fix it. Just as 16th-century astronomer Nicolaus Copernicus turned our understanding of the solar system on its head with his heliocentric model, we now need to radically reverse the way we view the global health landscape. The current method of basing progress, for example, on how many vaccine doses are distributed simply doesn’t give us a clear picture of who’s missing out. To get a real idea of how much progress we’re making, we need to place the child at the center of the immunization universe. We need an approach based on the precise vaccines each child has received, as well as nutritional supplements, de-worming and other health interventions. Until now, this has not been possible because of the often archaic, paper-based registration methods that are available in developing countries. But with the inexorable spread of digital technology and social media, that could now change. Technology and social media companies are already on their own mission to achieve global spread, reaching a point where everyone on this planet who wants one can have a digital and online presence. The kind of innovations that will enable this are exactly the same kinds of technologies we desperately need to reach those children who are missing out. From biometrics and data-analytics systems to wireless embedded sensors and energy innovations, it should now be possible, for example, to create new, affordable and secure digital ID systems capable of working in poorly resourced settings, even where there is no reliable electricity. By leapfrogging existing antiquated systems, this could enable every child to have a unique medical record that follows them through life. Until now we have got by with existing paper-based systems and made extraordinary progress in the process; increasing global childhood immunization coverage and halving childhood mortality since 1990. More children now have vaccination cards than birth certificates. But this will only get us so far. Currently 82% of children in the 73 poorest countries have access to routine immunization – as measured by receiving all three shots of a diphtheria-pertussis-tetanus-containing vaccine, or DTP3. This appears to suggest that we don’t have far to go, that only one in five is missing out. The trouble is, that fifth child is not standing next to the other four, but is living in the hardest to reach, most neglected and vulnerable communities, from remote rural villages to urban slums. What’s more, an even deeper problem exists. When you take into account how many children are receiving all 11 of the antigens that the World Health Organization recommends every infant must receive, a very bleak picture emerges. Based on analysis by my organization, Gavi, the Vaccine Alliance, just 7% of children living in those 73 poorest countries – those that most need our attention – are fully immunized. That means that more than nine out of 10 children are not getting the minimum recommended protection against infectious diseases, including the two biggest killers of under-fives: pneumonia and diarrhea. In addition to this, global trends, such as climate change, population growth, mass urbanization, and human and animal migration, are likely to make global health increasingly more challenging in the coming decades. Unless we find a way to make immunization more child-centric, there is a danger that progress will not only stagnate, but actually regress. To avoid this, we need safe and secure technological solutions to track every child. 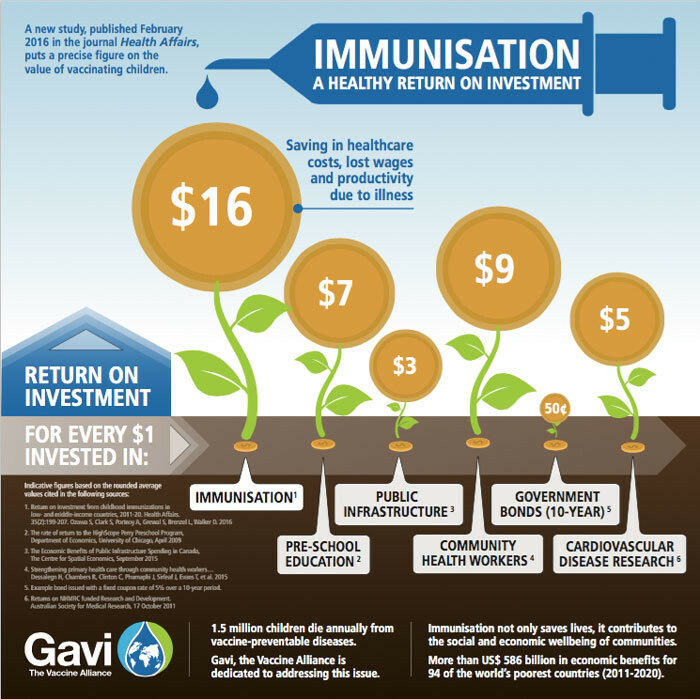 To this end, Gavi is now engaging the technology sector and investing tens of millions of dollars in innovations that might bring us closer to being able to monitor which children are fully immunized and which ones are not. Through its INFUSE platform, Gavi is calling for innovative solutions from talented problem-solvers, entrepreneurs and established corporations, with a current focus on digital technology for registration and verification of identity. Innovations like Flowminder, an advanced machine learning tool that combines geographic, human mobility and demographic data to improve population estimates and optimise resource allocation. Or Khushi Baby, a necklace that doubles as a medical passport. Medical records can be viewed and updated via an app, simply by tapping a smartphone against the necklace. Similarly, places like the World Economic Forum’s Center for the Fourth Industrial Revolution can help by creating global science and technology hubs aimed at societal good, while new organisations like ID2020 are being created to bring coalitions of industry to bear on this problem using innovative technologies such as blockchain. These are exactly the kinds of new approaches we need to bring about a Copernican revolution in global health – but we need more. Whether they are in remote rural villages or in the heart of urban slums, we need new technologies to put children at the center of the immunization universe.